Ready-made templates, advanced visitor segmenting and detailed analytics to continously improve your conversion rates. holdonstranger gives you 5 effective popup types specifically designed to boost your online marketing efforts, and help you rapidly grow your business. Each type has been tested, and optimized for maximum conversions. Grow your mailing list with popups specifically designed to turn readers into subscribers, opening the door for endless backend marketing opportunities. Make money on the backend by offering readers a coupon in exchange for opting into your mailing list. This gives you endless opportunities to present them with additional offers. Send visitors straight to your highest converting pages for a huge boost in profitable revenue with click-through style popups. Generate unlimited hot leads for your business using contact style popups that make it easy to get your visitor’s contact information without hassle. Skyrocket your conversions with 4 different creative popup styles tested and PROVEN to work. Pick the perfect one for each situation. Tried and true, this classic popup style has worked wonders since the dawn of the internet, and is still one of the most popular popup styles today due to is ability to grab attention, and get readers to take immediate action. Sticks to the top or bottom of the screen, always in sight, but never intrusive. This subtle, yet powerful popup lets your reader decide when they’re ready to take action, creating a better user experience. Eye catching without being overly intrusive, the slide in popup alerts readers without jarring them into annoyance. Getting your visitors to actually read your popups is half the battle, and this style will help you do just that. The ultimate attention grabbing popup. This style covers up the entire screen forcing your reader to take notice of your hottest giveaways, deals, and other offers. Change your popup’s fonts, colors, and animations in just a couple of clicks. It’s easy to create a coherent look that draws in readers by matching the look of your popus to the branding and design of your website. This subtle integration allows your popups to look like a natural part of your website, and ensures that they get read, and get conversions. Pick among a list of templates that look as good on desktops as they look on tablets and smartphones. Match the popup to your website and brand, by changing everything from it's colors and fonts, to the perfect entrance animation. Click and Type Directly on Your Popup! Reach the perfect headline and call to action in no time by seeing the text change in real time. Triggering your popup at the right time is one of the keys to increasing your conversions. holdonstranger lets you choose between 4 triggers that have been tested and proven to be most effective. It’s no secret that many people only stay on your webpage for a few seconds before clicking away. On Entry popups ensure that EVERYONE who visits your page sees your offer so that you never miss an opportunity for a conversion. These popups can be configured to activate right when your readers are most susceptible to wanting your offer. This level of pinpoint accuracy boosts conversions by targeting your visitors when they are psychologically primed to take action. By timing your popup to activate when your reader scrolls to a specific part of your page, you can match up the popup/page relevancy. This also works on a psychological level to target visitors when they’re most likely to take action. Being able to create your popups based off accurate statistical data on the behavior and psychology of your website visitors is what separates holdonstranger from our competitors. This incredible features allows you to get inside your reader’s heads, and understand exactly what offers will appeal to them most so that you can get bigger conversions, generate more profitable revenue, and rapidly grow your business. Discover which pages are most popular, and which ones are abandoned the most, to get an idea of what type of content and/or products your visitors are most interested in. If you are experiencing shopping-cart abandonment, you can throw your visitors a one-time discount impossible to resist. This alone can increase your revenue by 12% or more. If your visitors are leaving from your pricing page, you can present a downgraded version of your product as a “last chance” offer. This will capture a significant chunk of revenue that would have otherwise been lost. By tracking how many times your readers visit your website, you’re able to engage them with very specific popups relevant to their user experience. This can dramatically increase the short-term, and long-term effectiveness of your popup campaign. Show your visitors that you care by offering them something that welcomes them to the site, and keeps them coming back for more. IVisitors coming to your website on a regular basis obviously enjoy your content and/or products. Get them to sign up to your mailing list, or give them a special discount that leads them further down your sales funnel. 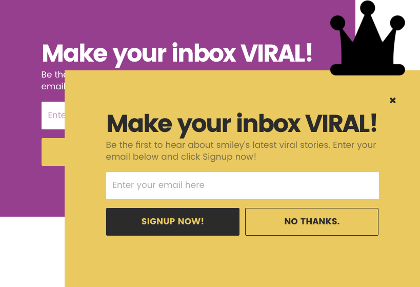 Create milestone popups that reward ultra-loyal followers. For example, you can present them with a special offer, gift, or coupon on their 10th visit, ensuring their continued loyalty, and willingness to spend money on your products/services. Sometimes its best to let your readers navigate around your site a bit, then hit them with the popup. This helps to put the popup into context, making it easier for them to understand. Scheduling - Based on The Time of the Day, Day of the Week, Day of the Year. Tracking visitor activity based on when they are the most active, and when they’re not, is one of the best ways to take advantage of active times, and compensate for lack of activity. If you have more visitors during evening hours, present hot deals at that time to make the most of it. You can also plan ahead by having a promotion already setup for Christmas, Thanksgiving, or other holidays/seasons that automatically starts on those dates. Asking a visitor to subscribe the second they land on your site can be off putting, and lead to decreased conversions in some case. By tracking the time each visitor spends on the site, you can time a popup to pop once you know they appreciate your content. Don’t pester your subscribers by showing them popups that ask them to subscribe to lists they’ve already subscribed too. holdonstranger allows you to exclude lists, or even sub-groups of your subscribers, ensuring that they only see relevant popups. holdonstranger’s innovative tracking technology allows you to determine where your visitors are coming from, and present them with relevant popups accordingly. If you have a lot of visitors coming from Facebook, you can ask them to share and like your FB page. If you have visitors pouring in from Twitter, expand your marketing reach by asking them to tweet your deals/offers in exchange for a reward. Keep making your popups better and better with simple analytics and quick AB testing. holdonstranger makes it easy to track how your popups perform over time. This allows you to revise popups that begin to experience lower conversions, or ditch them and create new popups to replace them. Determine which elements of your popups are producing the best results, and which need to be changed. Using consistent A/B testing you can double, triple, or quadruple your conversion rates. Measure the true impact of your popups with our deep tracking feature. holdonstranger will let you see not only if a visitor click through one of your popups, but if that click resulted in a conversion in the next or following pages. What a conversion is, or isn't is up to you to decide. 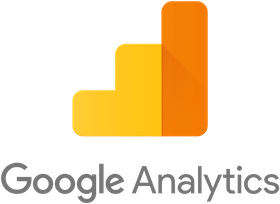 Complete Google Analytics integration compatibility gives you access to mountains of useful behavioral and psychological data you can use to fine - tune your popups for even bigger conversions. holdonstranger is designed from the ground up to be compatible with practically any type of website, marketing software, or autoresponder that you use. Just 4 Simple Steps and You’re Done: Click. Authenticate. Connect. Choose List. What is Zapier: Zapier let's you connect to 750+ services and apps in just a few clicks. These include: Salesforce, Zoho CRM, Intercom, GoToWebinar, and MANY more. How this Benefits You: By connecting holdonstranger with Zapier, you can seamlessly integrate it with your existing marketing and web software. Your subscribers email adresses and details are pushed directly into those services avoiding the need to manually import-export them. and our team will be happy to get holdonstranger set up and running for you. To help you get the most out of the holdonstranger software, we’re giving you a variety of resources that cover topics ranging from modern popup marketing tactics, to technical documentation, and more. Our guides and recourses are designed to help you follow best practices for popup marketing, and give you ideas that you can use to start making more money immediately. Learn what makes a popup go from bad, to good, to great. We’ll teach you why most popups get clicked away immediately, and how to create engaging popups that get visitors to buy or subscribe instead. By familiarizing yourself with the fundamentals of popup marketing, you can take your online marketing efforts to new heights of profitability. Remembering all the various techniques, strategies, and design elements necessary to create a high-conversion popup can be tough if you haven’t been working in marketing for the past decade. This cheat sheet is going to be your quick reference guide, and will teach you creative tips and tricks to help you stay on track when you’re feeling stumped. Get setup and profiting fast, even if you have no idea where to start. Our popup suggestions, the same responsible for bringing 1,130,000 leads to our customers with an average of 3% CRS, will help you maximize the effectiveness of your popup campaigns quickly, and without hassle. Whether you're an ecommerce website, a blog, or a service business, we've got the perfect popups and design strategies to get you started. The holdonstranger interface is as simple and easy to use as possible. But if you’re feeling lost, we have a standalone documentation website to help you get back on the road to profit. This technical documentation is designed to be user-friendly, and easy to understand even if you’re not a web designer, or coding expert. If you need some personal guidance or help, or if you just prefer talking to a human to help you with your troubles, you can reach to us right from the chat bubble inside your app. We’re greatly appreciate your business, and are always happy to help you in any way possible when it comes to getting the most out of the holdonstranger software. We have been using holdonstranger since October 2016 and till now it has earned us more than $50K of extra business. As dreamy as it may sound our conversion rate (in subscription) jumped by 15% over night. And the best part is their easy to use dashboard allows our marketers to do all the experimentation themselves without consuming tech bandwidth. Ready to experience the conversion boosting power of holdonstranger on your website? Designed to track the behavioral and psychological patterns of your visitors, holdonstranger is the next generation popup solution you’ve been looking for. Or see our friendly pricing.